Welcome to some weekend fun and entertainment with drones. We spend a lot of time scouring the web for news, information and more on all the great drones around the globe. In our travels, we encounter some fun and funny stuff, and we want to start sharing that with you. Today we will be taking a look at drones and dogs. Next up in our series, let’s explore some fun with drones and animals, more specifically drones and dogs. If you are looking for more info about using animals around drones, we teamed up with SoundGuys to talk about this in detail. This video by Jeff Myers showcases the best case scenario when walking your dog with a drone. In the video Jeff’s dog doesn’t seem to be bothered by the drone flying above him and even walks along with it. 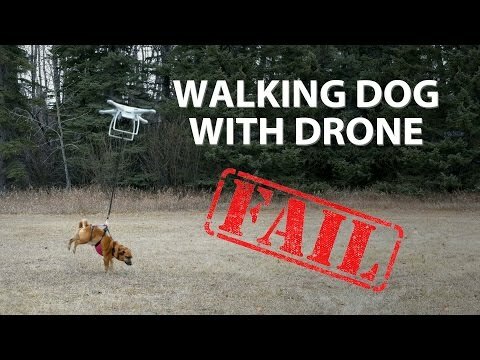 This video showcases the worst case scenario when walking your dog with a drone. Don’t worry, if you couldn’t tell, this video is fake, and drone fly-offs are far fewer these days, but we recommend you do not try this at home. To be honest, most drones cannot lift a dog, but they will react wildly with the strain of the weight, typically causing them to fly into the ground. A collision with your animal is more likely than your dog flying away. Please be careful.